What Causes Sewer Gas Smells In Your Bathroom? The unmistakable smell of sewer gas is one of the biggest issues that you can face in your home. Sewer gas smells can also pose a threat to you and your family. Sewer gas is emitted when waste materials in the sewer system begin to decompose. This gas contains a methane component, which is explosive and toxic to humans. If you experience sewer gas smells in your bathroom, you’ll need to take the right steps to fix the problem. Your toilet should be tightly attached to your floor with caulking or a wax seal. If your toilet wobbles when putting pressure on it, it may not be properly sealed and could be the source of the sewer smell. If you experience regular sewer smells, your plumbing may not have been installed properly and may not contain the traps and vents it needs. Vents and traps direct the flow of gas away from your home and provide a water barrier to keep gas from coming through your fixtures. If your plumbing lacks these features, then you’ll likely have an ongoing problem with gas leakage. Dry traps can be another cause of sewer smell in your bathroom. This U-shaped pipe contains water, which prevents sewer gas from entering your home. If the trap is dry, then its protection against gas leakage has been lost. The vent is a pipe that leads from the sewer to the roof of your home. The vent allows fresh air to get in while providing an outlet for sewer gas. If the vent has been clogged for some reason, then sewer gas will start to back up and cause your bathroom to smell. If you live in a home with older cast iron plumbing, you’re more likely to have problems with sewer smells. Older pipes have a tendency to crack, allowing odors to escape. 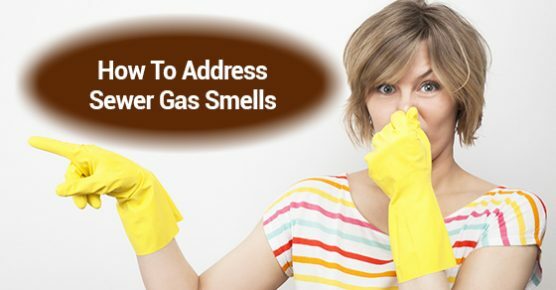 Eliminating the source of sewer gas smell in your bathroom isn’t impossible, but it can be difficult. Sewer gas leakage can be a result of a variety of plumbing issues, which makes the cause hard to diagnose. Consulting with a professional plumber will allow you to detect and eliminate the source of your sewer smell problem while protecting your family and home.